Pink, as a word to identify a colour was coined in the 17th century from the flower of the same name. In North America, pink is associated with love, beauty, charm, politeness, sensitivity, tenderness, sweetness, childhood, femininity, romance, etc. By the turn of the 20th century, pink got associated with anything feminine. It was in fact the clothing manufacturers in the 1940s, who decided on pink for girls and blue for boys. Their intention being that parents would have to buy a whole new wardrobe and set of baby accessories in pink if they had a girl and blue if it was a boy, rather than reusing the one set for both as before. The pink ribbon was first associated with breast cancer awareness in 1991. The pink ribbon represents fear of breast cancer, hope for the future, and the charitable goodness of people who support the breast cancer movement. It is also intended to evoke solidarity with women who currently have breast cancer. On Wednesday, 08 April 2015, on seeing our son Nikhil wearing a pink shirt to go to school, I enquired the reason behind in this sudden change in his colour scheme. Nikhil said that on the second Wednesday of April is observed as Anti-Bullying Day and all the students are to wear Pink. On returning home after dropping Nikhil off at the school, I decided to research into the new piece of knowledge I gained from our son. It all started on the first day of the new school year in September 2007 at Central Kings Rural High School, Cambridge in the Province of Nova Scotia of Canada. On this day, a Grade 9 boy wore a pink polo shirt to the school and the bullies harassed the boy, called him a homosexual for wearing pink and threatened to beat him up. In response to Angus Reid Institute survey on bullying in school, three in four Canadian adults said they were bullied while in school. Nearly half of the parents polled said their children have been bullied at some point. Among the 24 per cent who said bullying occurred regularly, often or continuously, 37 per cent said they still think about it and 19 per cent said the events had a serious and lasting impact. On hearing about the cowardice actions of the bullies, David Shepherd and Travis Price, two Grade 12 students decided to react against this act. They went on line, used emails, social media, and through word of mouth, conveyed their disgust and the need for the student community to raise against the menace of bullying. The two went to a nearby discount store and bought 50 pink shirts, including tank tops, to wear to school the next day. The next day, Davis and Travis were surprised to find that they ran out of pink shirts in minutes. They had to procure another 100 immediately and some students ran home to change into pink – head to toe. Within minutes, almost the entire school was in pink, a visible statement to the bullies that they were in the minority. The simple act helped change the dynamic at the school, which saw an end to bullying. Based on the reports of the event, The United Nations declared the official UN Anti-Bullying Day to be May 4 in 2012. The second Wednesday in April is designated the International Day of Pink and is observed in most schools in Canada. A study by University of Guelph, Canada, on bullying found that 50 percent school children report being bullied, and 45 per cent of surveyed children feeling unsafe when they go to school in Canada. 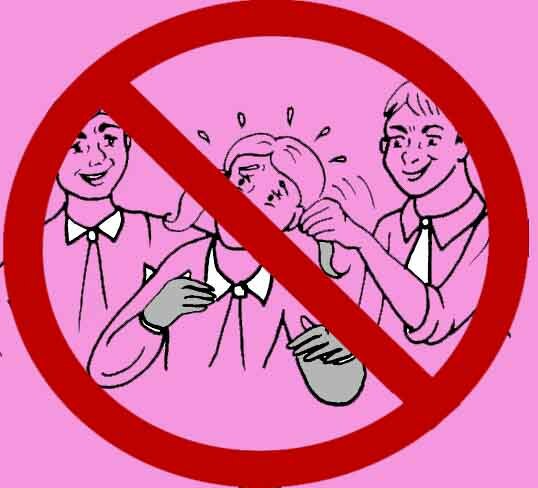 Boys typically engage in more physical forms of bullying; girls tend to do in indirect ways, such as gossiping , excluding and by using passive aggressive behaviour. Some researchers say that every seven minutes someone is bullied in Canada. Another recent survey found that cyberbullying surpassed drugs and alcohol as the top concern among Canadian parents. Remember that all these media attention and wearing of pink by all the students all over the world, were all started by two teenagers in a remote rural school in Canada. Rather than just giving up by the usual teenage rant that why should one bother about such flimsy matters or the feeling that even if one does something, it will ever have any effect, and so on, the teenagers need to act and demonstrate. One need to make a statement that enough is enough and such acts cannot go on. If the teenagers of the world take up such issues, I am sure that the parents will take not and the world will become a better place for the new generation to live. All the teenagers must take a leaf out of the actions of Malala Yousafzai for her single handed struggle against the suppression of children and young people and for the right of all children to education. Today she epitomises the struggle for right to education for girls in the under-developed nations and has been recognised by the world by awarding her the Nobel Peace Prize for 2014. You Can, You Must all act to Bring in the Change. Yes,very true. But we all wait for someone to bell the cat.